Make assessments instructive and interactive. 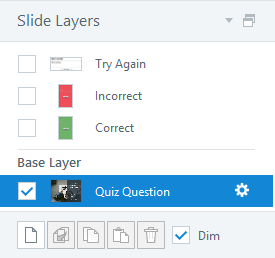 Articulate Storyline lets you give learners feedback as they answer questions, then branch them to different parts of your course based on their responses. Determine how feedback will be triggered. Go to the Question tab on the ribbon and choose an option from the Feedback drop-down. By choice: This lets you show different feedback for each answer choice. This option is only available for some question types, including Multiple Choice, Word Bank, Pick One, Which Word, Freeform Pick One, and Freeform Hotspot. Enter the appropriate text into the feedback fields. If you're displaying feedback By question, the fields are at the bottom of the window. 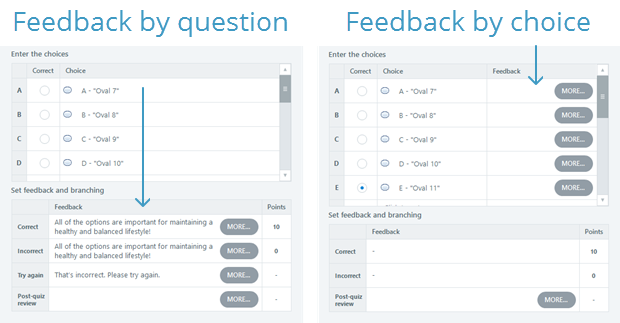 If you're displaying feedback By choice, they're to the right of each answer choice. To change how your feedback looks, switch to Slide View and edit the feedback layers. To give all the feedback layers throughout your course a consistent design, edit the feedback master. Determine how feedback will be triggered. Go to the Question Tools—Design tab on the ribbon and choose an option from the Feedback drop-down. If you're displaying feedback By choice, you'll need to switch to Form View to enter the feedback text for each answer choice. 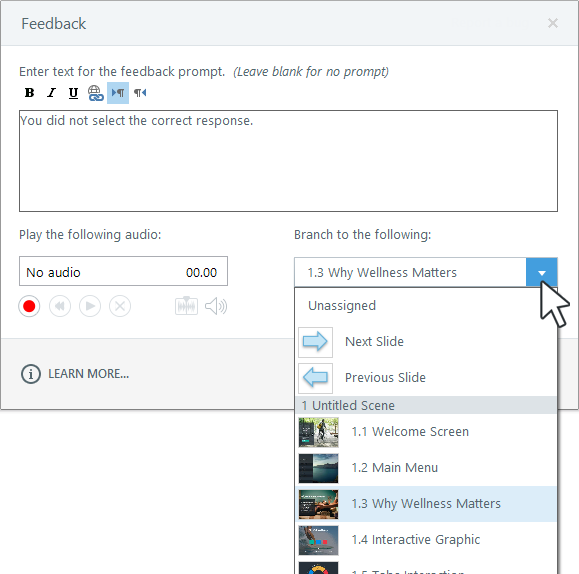 Thereafter, you can return to Slide View to customize the feedback layers. To give all the feedback layers throughout your course a consistent design, edit the feedback master. You can override the default text for a specific slide by typing new text into the feedback fields for that slide. If you'd prefer to change the default feedback text for all slides at once, edit the text labels in your player. Learn more about text labels. By default, all slides branch to the next slide in the course, but you can change this behavior. For example, you might want to branch learners to a certain slide if they get a particular question right and another slide if they get it wrong. Enable feedback for the question as described above. In Form View, click the More button beside any feedback field (except Post-Quiz Review). When the Feedback window appears, use the branching drop-down to choose what should happen when learners advance past the current slide. Specific Scene: Select any scene in your course to jump directly to it. Specific Slide: Select any slide in your course to jump directly to it. Result Slide: Select any result slide. This ends the quiz and takes the learner to the result slide.